Today is the 42nd edition of our periodic guest post series called 10 Questions and a Pizza Place. (The 1500′s are pizza fanatics.) We have a list of 17 questions we pose to fellow financial bloggers, and they are free to pick and choose 10 or answer all 17. Let us know if you would like to be featured in a future edition of 10 Questions. I first discovered the Frugalwoods way back in May when I read their 2 part post on refinishing cabinets. I was immediately impressed. The posts had lots of good information. The instructions were very good and well written. The pictures were great. It was clear that these people were serious about producing a quality blog. I bookmarked Frugalwoods in some corner of my brain and have continued to visit ever since. The ridiculous (and by “ridiculous”, I mean “awesome”) greyhound pictures make a visit to Frugalwoods worthwhile all by themselves. 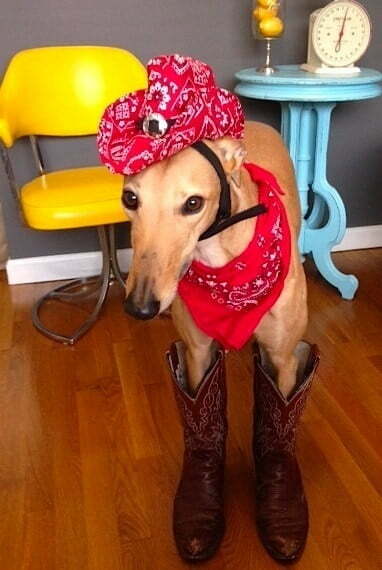 I often wonder what is going through Frugal Hound’s mind when she is wearing cowboy hats (see below), cleaning rags or sporting pumpkins. Enough blabbing from me. Please enjoy their answers and then make your way over to Frugalwoods and introduce yourself. You won’t regret it. Tell me about your blog and why it’s great. We’re Mr. and Mrs. Frugalwoods (+ Frugal Hound) from www.frugalwoods.com, self-proclaimed frugal weirdos living in Cambridge, MA. We pull stuff out of our neighbors’ trash, use leftover hotdog buns for sandwiches, haven’t been to a movie theater in over 10 years, and Mr. FW is a freaking bike commuter. Basically we’re a menace to mainstream consumer culture. Mr. 1500 note: I love this picture. Frugalwoods (est. April 2014) is a living documentation of the accelerated final three years of our journey to financial independence and a homestead in the woods (more on that in #2). We’ve been frugaling it up together for ten years, but this is our most intensely-focused sprint of frugality. Barring unforeseen calamity, we’ll enter early retirement in 2017 at age 33. We co-write Frugalwoods (and are married in real life! ), which enables us to diversify and cover a wide range of topics. We make a pretty good team, both on and offline (permission to gag now). Our blog is great because it has lots of photos of our greyhound, Frugal Hound. What are your biggest goals in life? Our biggest goal in life is to not regret the way we spent it. We don’t want to reach 40 or 50 and realize we’ve wasted our best years behind a desk. To that end, in 2017 we’ll both quit our 9-5’s and move to our yet-to-be-purchased homestead, hopefully on 30+ acres of wooded land in rural southern Vermont. We also want to have kids and raise them in this rural environment with plenty of streams and mountains to explore, and an absence of the materialistic, high-stress childhoods we see playing out in the city. We won’t be entirely sans income after early retirement–we’ll rent out our current Cambridge, MA home, grow our own veggies, plant fruit trees, build a few cabins/yurts/tiny houses to rent out on Airbnb, create hiking trails on our land, brew our own beer, attempt to launch Frugal Hound’s runway modeling career, freelance edit and write (Mrs. FW), maybe teach yoga (Mrs. FW), weld-for-hire (Mr. FW), do freelance software development (Mr. FW), and whatever else comes our way. We’ll be able to comfortably withdraw 4% from our investments to cover basic living expenses. The Frugalwoods plan = avoid consumer culture + live a fulfilling life of true purpose and intention + hike a lot in our own woods. What is the best financial move you have made? 1) Marrying the right person. Nothing screws up your life like a partner who is not on the same page financially or otherwise. We’ve seen friends go through divorce and it’s both heart-wrenching and finance-destroying. Neither of us would be nearly as successful or happy without the other’s support. Together we are more than 1+1= 2. More like 1+1= ∞ (math joke!). 2) Moving for our jobs. We were able to dramatically increase our salaries by moving across country. We’re both 30 and have lived in 5 different places (Kansas, New York City, Washington, DC and Cambridge, MA twice) since graduating college. It’s incredibly foolish to limit yourself geographically at the outset of your career. For those crucial first few years, push yourself out of your comfort zone to take advantage of the best salaries. And then once you retire early, you can live (basically) anywhere you want! What’s your favorite tip for saving money? Buy used. Anytime you consider purchasing something, your first thought should be: how can I buy this used? We have a used car, used couch, used house, used greyhound… among many other used, but not used-up, things. Buying used also gives you an excellent exit strategy. If you buy used, you can usually turn around and sell the item for about the same price. If you buy new, on the other hand, the item is going to depreciate immediately and you won’t be able to sell it for what you bought it for. Every hike we’ve ever hiked together. It’s our absolute favorite way to spend a day and we’re never more relaxed or at peace than when we’re tromping up a mountain hand in hand. Our most outstanding hike was probably the Na Pali coast in Kauai. We climbed a mountain, swam under a waterfall, gazed down at the ocean, and spent the day talking and thinking together. We only had one asthma attack and a sunburn–so, total success! What product or service epitomizes consumerism? The “random box of junk” delivered to you each month. It’s literally stuff you don’t need that you’re paying money for every month–I’m looking at you Birch Box, Bark Box, Custom Toothpicks Box. In addition to receiving unnecessary crap, you’re paying to be marketed to–they send little samples to entice you to pay even more money for the full-sized product! You’re not even getting something useful, like for example a Bacon Box. I admit that a Bacon Box is equally useless and I’d never pay for it, but at least you’d get to eat some bacon. These boxes embody the idea of being a consumer just for consuming’s sake. And the genius thing about the boxes is that the companies get the stuff for free and then turn around and sell it to you! So their profit margin is insane–it’s a great business model for the company, but completely worthless for the consumer. What advice would you give to a 24 year old, just out of college? Keep living like a college student for as long as humanly possible. Start saving for retirement immediately and learn to embrace the college student lifestyle for the long-term. Mrs. FW says minus the keg stands; Mr. FW says OK on the keg stands as long as you don’t buy the keg. What is your favorite place to vacation? Mr. FW: Anywhere with a woodstove, craft beer, a porch, and mountains I can hike. Mrs. FW: Anywhere that has wine. What was your favorite job (or worst job)? Mrs. FW: Gotta go with worst. Immediately after undergrad, I worked 40 hours a week as a “document preparer” at a document scanning agency. I smoothed pages, removed staples, and stacked files neatly. I was not qualified to use the actual scanner. Mr. FW: Gotta go with best. I was the assistant wedding coordinator at my church during high school. I only worked on the weekends and got paid in cash to set up a few tables and make sure the place didn’t burn down. Usually the biggest disaster was learning that a bride didn’t have enough body glue. Luckily, I knew the closest body glue purveyor and, I had no shame. Write your own question: What’s the greatest thing you’ve ever taken off the side of the road? Mr. FW: My 1970s Sears brand, 25 lb, cast-iron beast of a circular saw. If it ever stops sawing, it’ll double as a sledgehammer. Mrs. FW: Definitely my LL Bean, down-filled, knee-length winter coat. Admittedly, I have to step into the coat as the zipper is broken (it does zip up though). Small inconvenience for the free-est, warmest, most waterproofiest coat I’ve ever owned. What is your favorite pizza place (I am a pizza nut)? Fellow pizza nuts here! We have a delicious and delightful local joint in our neighborhood that makes amazing pizza: City Girl Café. It’s a hidden gem of Cambridge and a miraculously efficient use of resources: 6 tables, 1 server, and 1 chef. Thank you Frugalwoods and Frugal Hound for those highly amusing answers and pictures! Frugal Hound, I can’t wait to see what you have in store for Halloween. Please pay them all a visit on their blog and give them a follow on Twitter. Love the FrugalWoods, and love the 1500s! I’ve been a closet fan of both for months, and am finally stepping out into the world of blog commenting. Thank you so much! I’m a fan of the 1500’s as well 😉 Glad you’re commenting–it’s always fun to hear from people! I enjoyed your take on what matters in life, and it definitely isn’t “more stuff”. I truly hope you guys are able to get to your version of early retirement in a few years here, complete with the homestead. Sounds like a dream for you guys! Many thanks! Frugal Hound is definitely a Hound about town :). You are so right–it’s never about stuff. And, I really hope the homestead becomes a reality too! Wow, I didn’t realize how extensive your retiring to a rural homestead plan was. Building cabins/yurts, making hiking trails, and brewing your own beer? Count us in for a stay at Frugalwoods BnB. Seriously. When that happens, we’d love to come out to Vermont. Never been, hear it’s beautiful, especially in Autumn (my favorite season). We’re also torn about the moving anywhere for salaries. Our jobs are fine, but don’t pay amazing. However, I’ve lived here my whole life, my parents live her as do hers. It would be hard to leave our family behind. That said, our parents are thinking about moving out of state, so that would make our decision much easier to move out and live somewhere new. We’d love to have you at the Frugalwoods BnB! That will be so fun! Although the 1500’s have called first dibs on a cabin :). Autumn is absolutely the best time of year, I’m convinced. Moving for jobs is definitely a tough decision. It’s been made easier for us by the fact that both of our parents moved to totally different states (CA and NC) a few years ago, so we’re spread across country no matter what. I’d rent a cabin too! Awesome! We’ll be booked up in no time! It is a dream of mine to convene a bunch of us FIRE folks at our place for a weekend (week?) of revelry. Yes, I’m glad I’m #1 on the list. As a bonus, I’ll bring beer, good beer. And candy corn. Thank you so much for featuring us today, Mr. 1500! 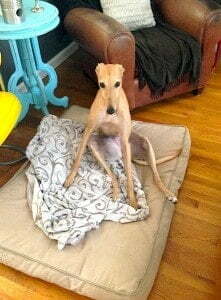 We’re deeply honored and Frugal Hound is super embarrassed about that photo of her failing to sit properly. Greyhounds: not sitting animals. This post was a blast! Greatly looking forward to working with the Frugalwoods (and Frugal Hound) more in the future! This was great – I already snooped out everything over at Frugalwoods but now I got some more over here! Haha amazing find on the saw – and WTF are these boxes you speak of!?!? Steve, you creeper ;)! I know, I don’t understand those boxes at all either, but people pay big $$$ for them every month. Very cool, I always enjoy reading these posts to learn more about my fellow bloggers. You guys will need to come over to BC Canada and check out all the awesome hikes one day. Squamish, Whistler, and Pemberton areas have some amazing hiking trials. Mr. FW and I would love to hike in BC–it sounds and looks absolutely beautiful! ha ha I love the random box of junk comment. I know so many people who do this and just end up with loads of random stuff that breeds more stuff. I love your life plan and the choices you guys make. Very inspirational! That is awesome. Love the site and FW’s plans. So nice to have goals and be able to accomplish them early in life. Way to go! Lance @ Healthy Wealthy Income recently posted…I’m the Boss – Leadership, Management, Resumes, Raises and More! I KNEW you’d want to make your home in Vermont! Yes!!!!!!! I’m in Northern VT, but it’s all close anyway! Yay Vermont! Most beautiful of states! I loved this!! I love following the Frugalwoods and Frugal Hound. 🙂 I completely agree with the comment about marrying the right person. I have two married clients who both have stay at home wives. One wife is frugal and looks out for the family finances and her hubby has a lot less stress and won’t have to work forever because of it. The other wife is the opposite of frugal and I feel for the hubby because he stresses about money all the time and will probably never see retirement. You really need to work as a team to make smart financial decisions. Agreed! I think it’s just much easier, and happier, if you’re on the same page financially as your partner. Plus, Mr. FW and I serve to motivate and encourage each other towards our shared goals. Thank you so much! You’re too sweet! I do plan to continue bloggin’ on the homestead, though I’m sure my writing will evolve and change to some extent. I love your plan, teamwork and, of course, your amazing sense of humor (the dog makes for a good prop, too!). So glad you made it as a finalist for this year’s Plutus Awards (can’t believe 1500 Days didn’t…what’s up with that?!?!?!?!). Thank you so much! I appreciate it. I can’t believe 1500 wasn’t a Plutus finalist either!! What was up with that?! Ha, you both are too kind. Little known fact: I was a finalist for a Flatus award. Kitty PoP and Frugal Hound might be more similar than I thought – he doesn’t know proper sitting postures, either! He does not groom like a normal cat, which I blame on a lack of kitty role models. We are on the same wavelength Mrs. PoP. I suggested this very thing to Mrs. FW just yesterday. Cool answers there Mr & Mrs Frugalwoods – I admire your lifestyle and agree an ideal holiday has a woodstove, mountains and the beverage of your choice – wine for me ta. Woodstove, mountains, wine (or craft beer)…. ahhhh. Sounds divine to me! I think that’s so awesome that you will reach financial independence by 2017. You will beat the Irishman and me. Your vision for your future sounds wonderful! Love following your journey. Will you get a cat when you set up your homestead? Will Frugal Hound learn to get along or will she be the mouse catcher? Frugal Hound actually caught a mouse outside once! I love cats and grew up with them, but Mr. FW is somewhat allergic to them. So, I’m not sure if they can have a home on the homestead. Great interview! I am with you on the hiking. It is also my favorite thing to do besides foraging. I am looking forward to your Vermont adventure. There is nothing like growing your own food. Frugalwoods, I love you two. Your plan for 2017 and beyond sounds like an absolute dream! Oh thank you so much! We really hope it’s a dream that comes true (forgive the terrible cliche 🙂 ). The FW’s are definitely a blog I follow because they deliver solid content with a lot of wit along the way. It’s great to read about people who get so much out of living life by doing it simply. Thank you, Kassandra! I really appreciate that :). We try to just love the act of simply living. Just discovered the FrugalWoods (well actually the Mrs. did) and I have been reading ever since. My wife wants to try homesteading now and we love the Frugal Hound…although our frugal cat would probably wince if we mentioned that aloud. Thanks for the great interview and post Mr. 1500, always great to see a new post pop up from you. FinCon 2017 is at the Frugalwoods’ ranch! Calling it now! Great interview! I totally agree with raising kids in rural areas. (Although we do like to visit cities from time to time) My 7 year old can hike for 10 miles on a good day. She climbs trees and plays with my friend’s chickens. When we went to Yellowstone, we were obviously smitten with the bison walking all over the road. Besides that, we were total wildlife snobs. You’d see all these cars lined up to look at an elk or deer, and we have those in our back yard! That sounds idyllic, Kim! Exactly what we’re hoping to have. Frugalwoods you crazy kids! Fun to learn a little more about you guys. Every time I see pictures of your dog in costume of some sort, I always think if dogs could only talk, might be a separate blog on her own(coming soon I’m sure). I’m curious on the craft brews, have you guys started brewing your own yet? I’m not there yet, but I think I will be brewing some of my own next year, for frugality purposes of course. We haven’t brewed our own beer yet–I think it’ll be a homestead activity. Right now we lack the time as well as the capacity to drink that much beer :). We’ll need to figure out a way to give a lot of it away if we do brew. I’m open to helping on the “give a lot away” portion! I love this interview, that goes without saying, but I really like the consensus in the early comments that Autumn is the best ;). I laughed pretty hard and “used greyhound’ – poor Frugal Hound! This is a great interview and nice to see some Massachusetts folks embracing financial independence. I especially loved the vacation with the wine. Perhaps, the best place to go is in New Hampshire, where all of the wine tastings are free or the Finger Lakes region of New York where most of the tastings are $1 or $2. An excellent way to spend a frugal afternoon or two with wine. Thanks so much! We actually haven’t been to many wine tastings (given the cost), so I’m excited to hear there are free/cheap options in our region. We’ll have to check it out! Frugalwoods are great! Do check them out!